I do not typically get into Valentine's Day. I find it a bit silly. But I'm all for any excuse to make an ordinary day extraordinary for my kids. And who doesn't love a pink explosion and candy and cookies and an extra reminder to love and appreciate. And hugs and kisses. You can't forget the hugs and kisses part of Valentine's Day. That's my favorite part. This year Spencer actually has friends aside from the ones we've introduced him to from our own circle of friends. 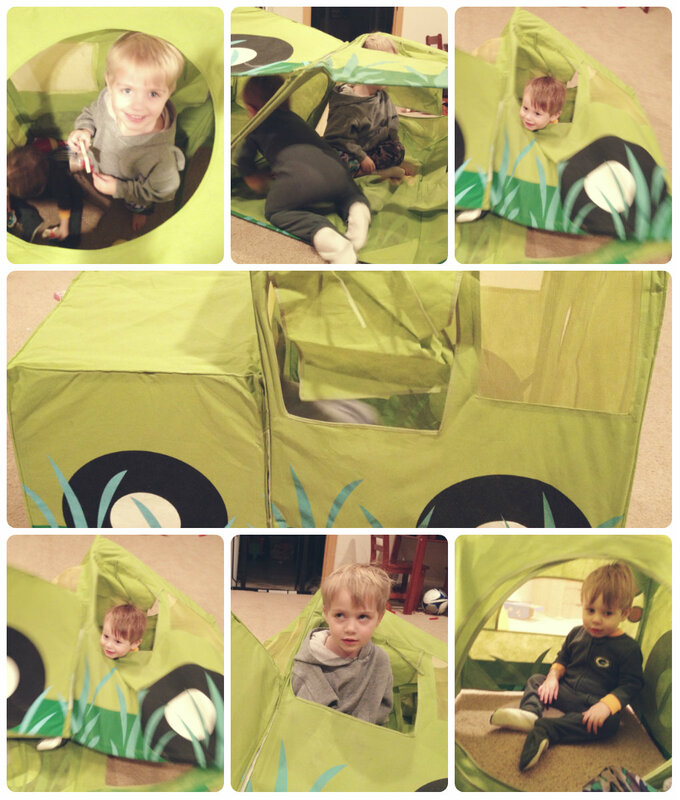 He has his preschool friends. The names I hear the most are Trenton and Claire. Although he didn't quite understand the concept of Valentines Day, he did get excited at the idea of giving his new friends candy and cards (and, of course, receiving some, too). We started working on our homemade Valentines last week because I had a feeling it'd become a drawn-out process. In all honesty, I ended up doing 85 percent of the work. I'll have to rethink what kind of Valentines we make in the future. Since Spencer's favorite movie right now is Cars 2, and he loves Finn and (especially his crush) Holly, who are spies, I decided to somehow include that into his Valentines. We first colored with white crayons on white paper, so the picture was virtually invisible. Spencer did not enjoy this and kept asking for some different colored crayons. He was having trouble seeing the big picture, even though I explained several times that we were making secret spy pictures for his friends. 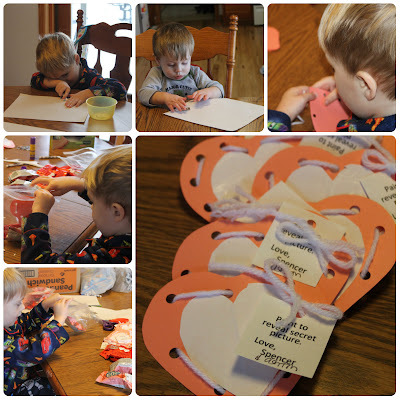 After I cut out and glued a bazillion hearts, I punched holes along the border of the hearts. Then Spencer threaded yarn through the holes. Well, he made it halfway through one heart and decided he'd rather ride his bike, so I ended up doing the rest of the bazillion. I attached a note that said, "Paint to reveal secret picture." The white crayon will show up once painted over. Since we also handed these cards out to friends outside of preschool, I added Ashton's name to a bunch, too. 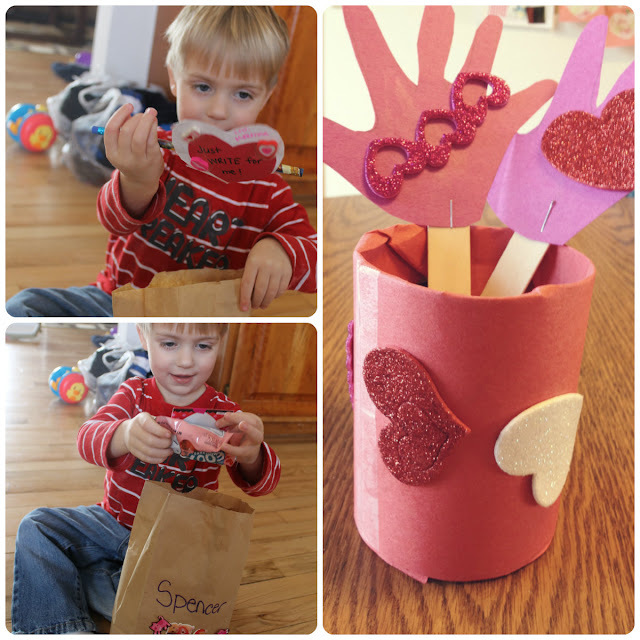 Valentine's morning Spencer burst into his little brother's room and yelled, "Happy Valentine's Day!" over and over. He was very excited to begin the day of love. At preschool he exchanged cards and then impatiently asked me over and over at home if he could open them all. Being the mean mom that I am, I made him wait so he didn't fill his little belly full of candy and miss out on our very special lunch--pink heart-shaped chocolate chip pancakes. Spencer on a sugar high (and juice mustache) after his party at preschool. Finally opening his gifts from friends. He made us the gift on the right. 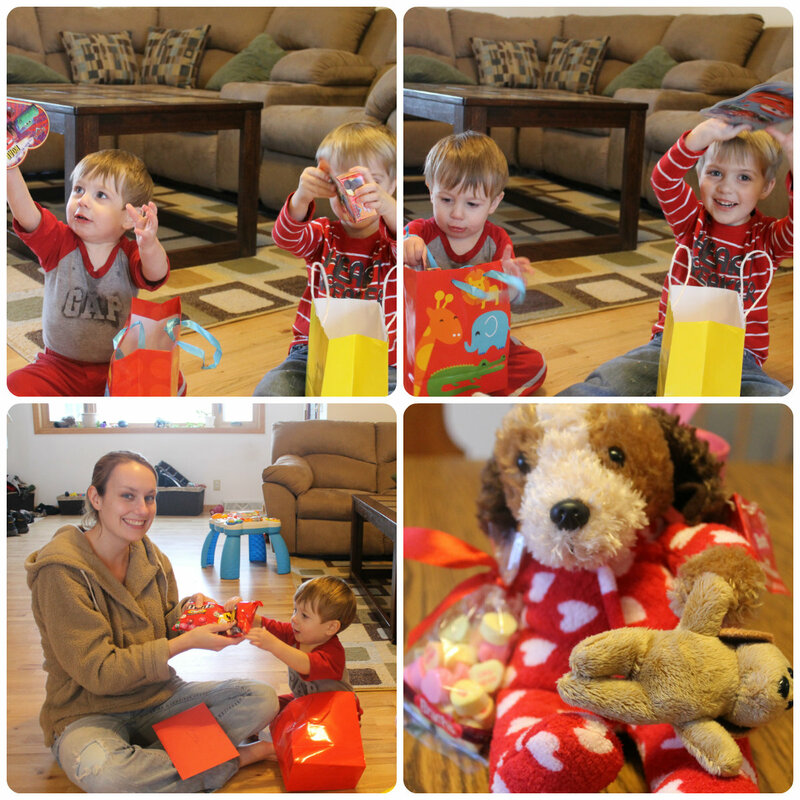 I had a whole day planned with fun Valentine's activities, but the boys napped too long. 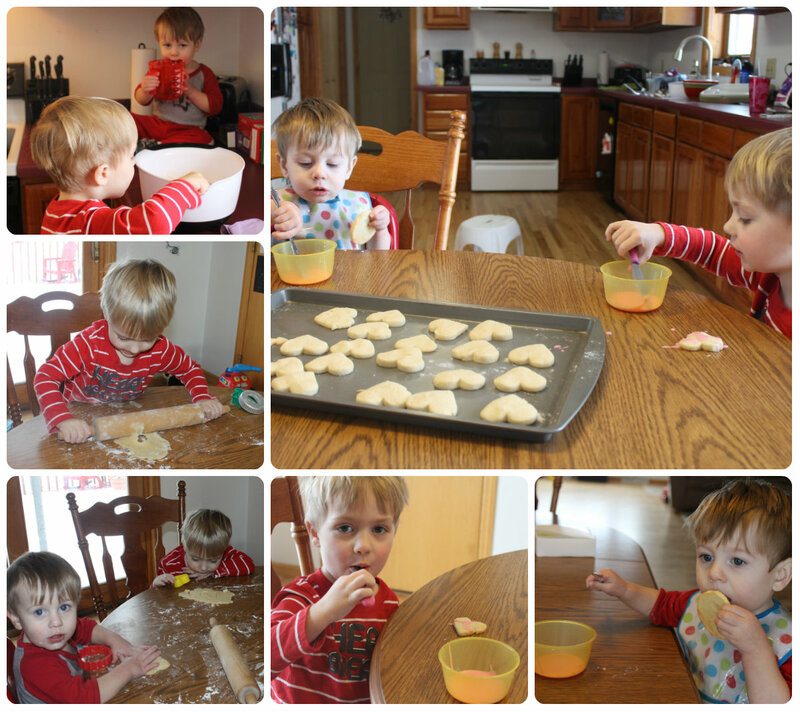 We were able to make cookies and sort of play a game while I made supper. The rest will have to wait for another day, I guess. 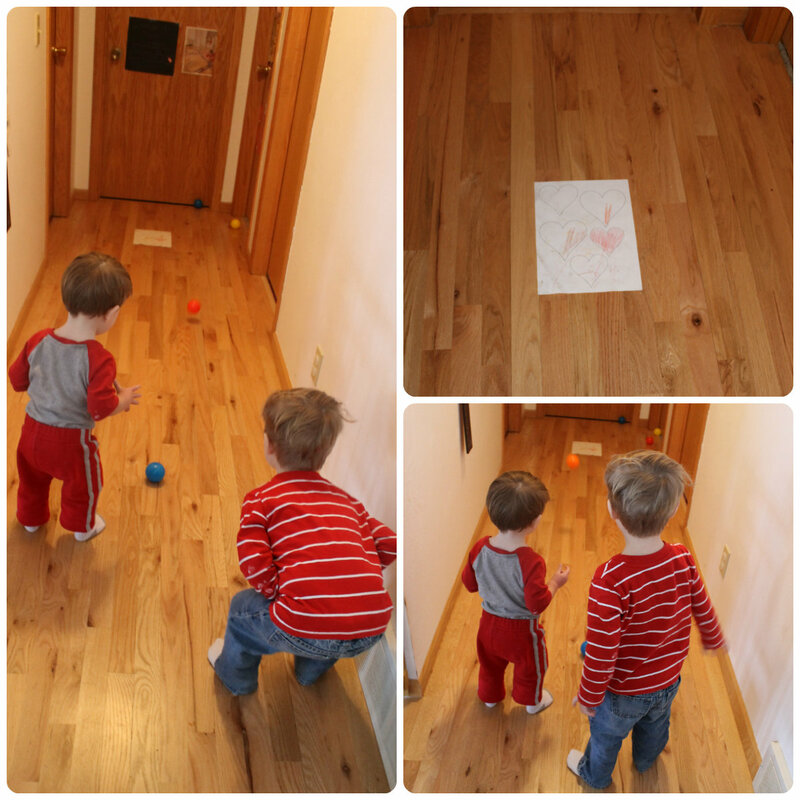 The goal is to roll balls onto a paper full of hearts. 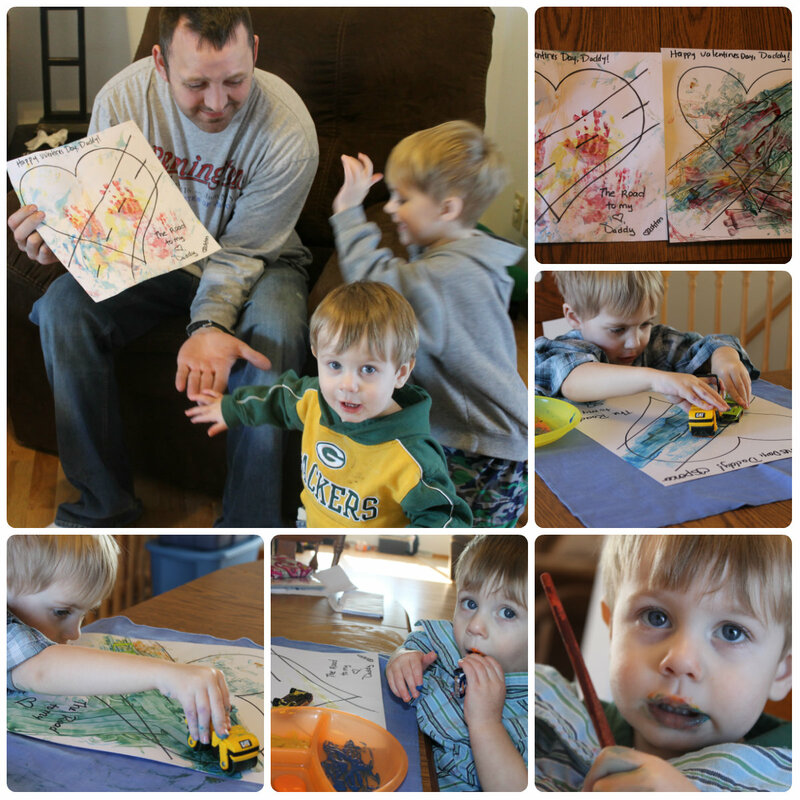 This week the boys also made their daddy a Valentine's Day card. I was proud of the fact that I came up with the idea all on my own, no help from Pinterest! I drew a heart with a road going through it. The boys painted using cars as paintbrushes. The card says, "The Road to My Heart." Once Dave was home from work, we opened our gifts from each other. The boys got some candy and books. Dave got me the cute little puppy in the below picture. Spencer picked out a card for me that said I was a great dad and would not be persuaded to get one specifically for moms instead. 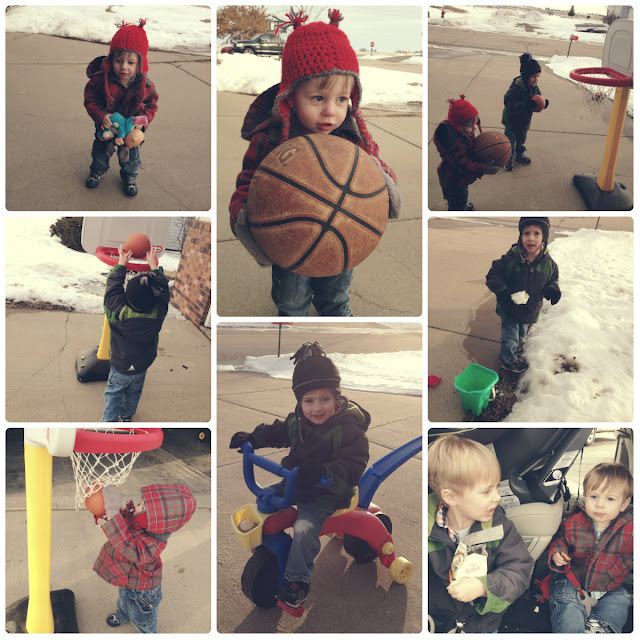 After a long day at the chiropractor and running errands, the boys enjoyed a snack before we headed home. Ashton's appointment went well. He's very much out of alignment and has inflamed lymph nodes in his neck that I need to massage out. Dr. Amy wants to work on boosting his immune system, so it can actually fight off all these illnesses that keep bringing him down. She suggested we give him natural supplements: fish oil, probiotics, and garlic drops for his ears. This was a spendy concoction of supplements, so hopefully they work their voodoo magic and help my baby from getting sick so often. We will visit Dr. Amy again in a few weeks for another adjustment. Hallway makeover. I wrapped a wooden M in yarn and hung a clearance mirror from Target. The other two feet pictures were already there. We were able to enjoy some time outside since the weather was a bit warmer.